MAE WEST met Alan Young [19 November 1919 — 19 May 2016] when she was invited to guest star on the popular TV series "Mister Ed," about a talking horse. Alan played Wilbur Post, the architect who owns this intelligent 4-legged creature. The CBS show ran for six seasons (1961 to 1965). • • Actor-comedian Alan Young, who played the amiable straight man to a talking horse in the 1960s sitcom “Mister Ed,” died of natural causes. His children were around his bedside. He was 96. • • His death occurred at the Motion Picture and Television Home, where he had been in residence for the past four years. • • Alan Young was an English-born Canadian-American actor, voice actor, comedian, radio host, television host and personality best known for his role as Wilbur Post in the television comedy series Mister Ed and as the voice of Scrooge McDuck in Disney films, TV series and video games. In addition to Mae West, an eclectic group of celebrities, including Clint Eastwood and baseball great Sandy Koufax, made lively guest appearances opposite the talkative horse. • • It was Monday, 27 May 1935 and Mae West fans were lining up to see the screen queen in "Goin' to Town" opening its exclusive engagement at Capitol Theatre in Ontario, Canada. • • That week in Ontario, these feature films were onscreen: "The Bride of Frankenstein" starring Boris Karloff and "Loves of a Dictator" starring Olive Brook (at the Tivoli). • • Talented artist Tom Tierney released his wonderful "Mae West Paper Doll" book on Friday, 27 May 2005. Dover published it. You must have a copy in your collection of Westian. 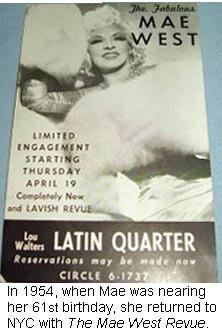 • • Louis Sobol wrote: Johnnie Ray travels backstage of the Latin Quarter to pose for a few camera shots with Mae West . . .
• • The Mae West Blog was started eleven years ago in July 2004. You are reading the 3451st blog post. Unlike many blogs, which draw upon reprinted content from a newspaper or a magazine and/ or summaries, links, or photos, the mainstay of this blog is its fresh material focused on the life and career of Mae West, herself an American original.